This was the First Methodist Church be fore it burned down. I was baptised here when I was 16 years old. To the right is Dubreuil's Motor Chrysler-Plymouth Sales, formerly Jackson's Garage. This is the Telephone Switch Building. To the left is Bale's Pontiac. To the right is Gee's Electric and next right, across an open space was the Herald Publishing Company. The bottom of photo, is where we lived in 1940. Across the lived a Pere Marquette employee, Mr. Carter who was on the road most of the time. His wife, Mildred had this wonderful wood fired cook stove where she made the best bread every Saturday. She also feed railroad hobo's. 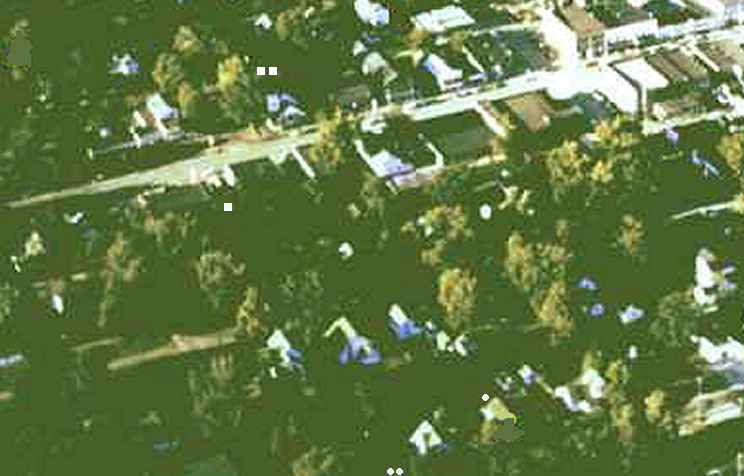 A couple houses to the right of Carter's is where we lived from 1948 to 1950.